According to the analysts, the app removals increased 238% in October. Earlier this year, Apple asked the developers of the outdated apps to update the software and make it comply with the App Store policy and guidelines. The deadline for this task was September 7. After this date, the company started to remove “old” apps and become incredibly active in this in October. Apple deleted 47,300 apps over the last couple of weeks. And while it’s true that Apple does delete apps on a regular basis, this figure is around 3.4 times higher than the monthly average of 14,000 for the months of January through September. 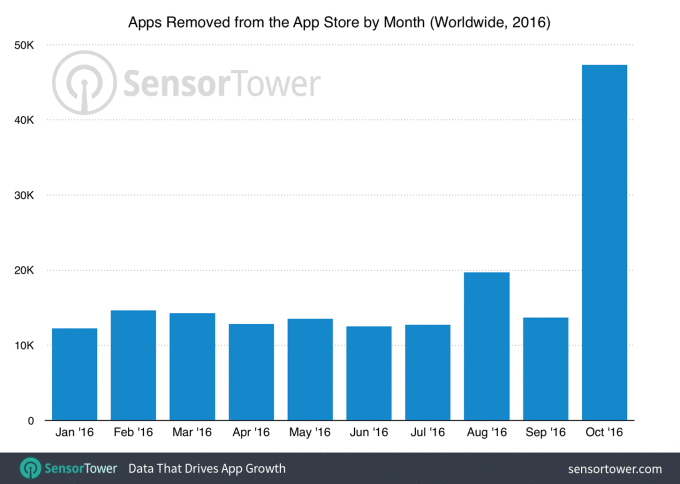 28% of those apps that were removed are games, 8.99% are apps from the Entertainment category, and 8.96% are books. The apps deleted from the Education and Lifestyle categories made 7% and 6% respectively.